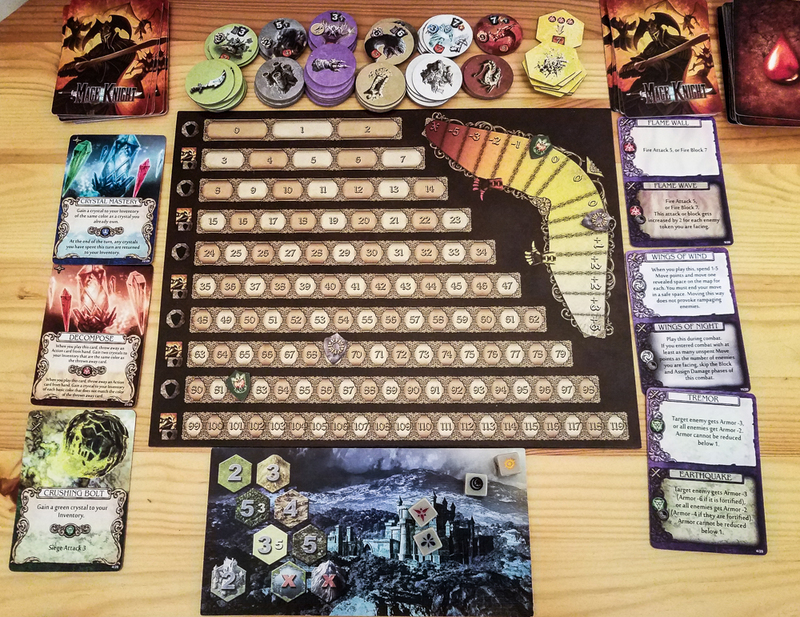 This Mage Knight board game review was made after playing the game about 15 times. Released in 2000 as a miniatures war game similar to Warhammer, Mage Knight has since become a massive success and spawned everything from comic books to video games. It was turned into an adventure board game in 2011 by WizKids Games and Asmodee. It includes scenarios for solo, cooperative, and competitive play. I’m not going to go over the Mage Knight rules. That would take forever and would just confuse you anyways. Instead, I’ll just go over the game’s flow so you can get an idea of how it plays and if it’s the right fit for you and your group. Meant for gamers aged 14 and up, Mage Knight is all about exploring, building up your characters, fighting, and gaining fame. 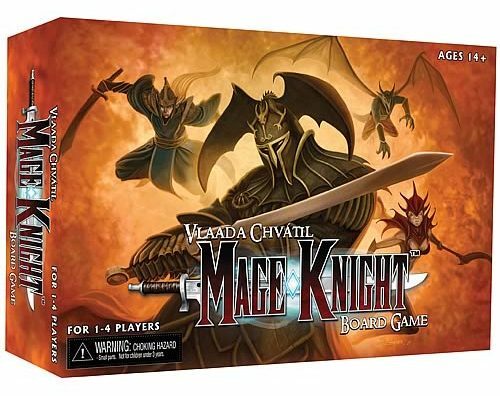 The game puts you in control of one of four creatures, called Mage Knights. Your objective depends on the scenario that you choose to play. In Mage Knight, you’ll be exploring, beating down the monsters in front of you, and attempting to conquer different cities. As you gain “fame,” you’ll move up in levels, which allows you to become more powerful by having tougher shields, more cards in your hand, and even special abilities. On your turn, you’ll be developing your character by filling your deck with actions, spells, and artifacts as you explore everything from cities and dungeons to the dark caves of the world. Those cards you get can be used for actions such as blocking, attacking, and moving. What’s really cool about the majority of the cards in the game is that you can use mana crystals to make them even more powerful, but it’s important to use that mana wisely since it can be tough to come by. The deck building aspect of Mage Knight is very strong despite being treated as a secondary mechanism in the game. That was a very brief overview of a very complex game. If you want to see all of the Mage Knight rules, check out the official rulebook (PDF). 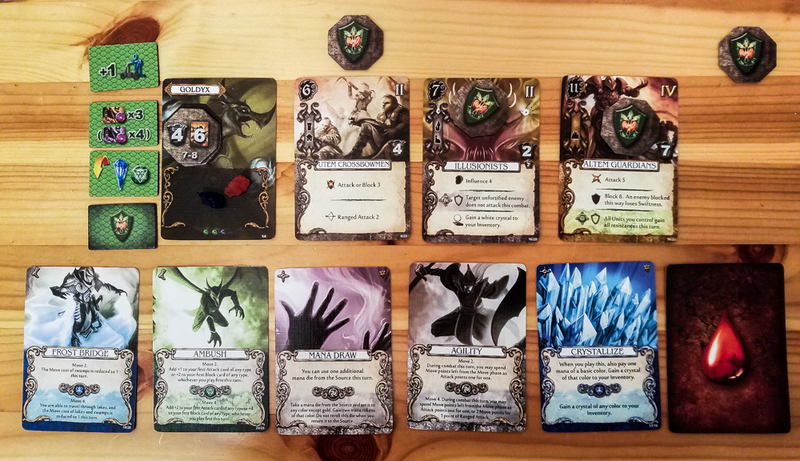 The best thing about Mage Knight is the variety of ways that each game can play out. You’ll have random tile layouts and random monsters show up, so each game will play out in different ways. This provides it with an immense replay value. The component quality is fantastic. The tiles, the miniatures, the dice, the tokens, the cards… everything has a great look and feel. The unique world also comes through very well with the well-designed cards, tiles, and miniatures. Players who get through the early confusion will find that the design of the game makes the long play-time go by very quickly. This is one of the best board games to get if you want a ton of game in a single box. There are 11 different scenarios, including solo, co-op, and competitive scenarios. There’s a reason why a lot of people think of Mage Knight as the ultimate “stranded on a deserted island” board game. This game is right up there near the top of the list when it comes to true adventure games. Again, the experience is massively enhanced once you’ve figured out how to play, so don’t give up on Mage Knight until you’ve had a confusion-less playthrough! There are so many rules to remember! In your first 10 or so games, you can expect to mix up or completely forget about at least a couple of rules. In fact, I’ve talked to multiple people who have been playing this game for a while and still forget about some rules. Speaking of the rulebooks, while it was nice that they covered everything when they made the Mage Knight rulebooks, it is extremely hard to use it as a reference guide. If you forget a rule or simply need help clarifying something in the game, it could take you a while to find it in the books. Because it is vital that you do the most that you can on each turn, some players will take a while to think about and go through all of their actions. This can both extend an already long game and can make other players around the table a bit impatient. 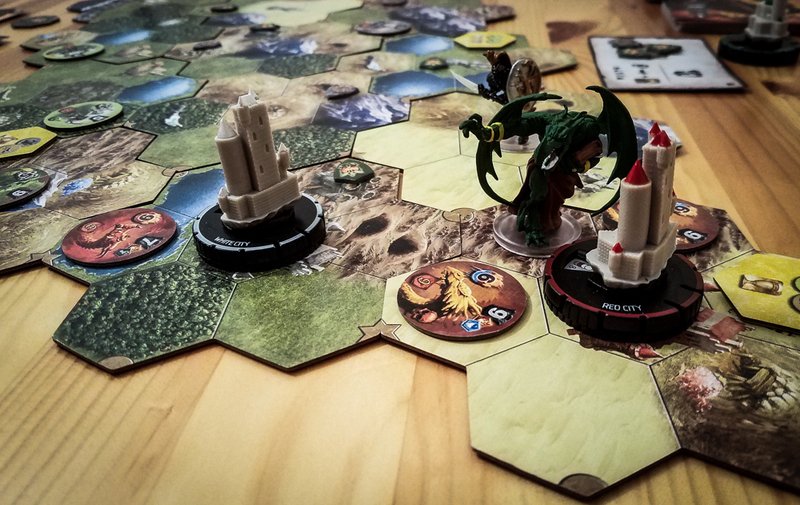 If you’re willing to take the time to learn each of the rules of Mage Knight, chances are you will think it is an excellent solo, cooperative, and competitive board game. I’d say it’s best as a solo or two-player co-op, but it certainly does work at higher player counts. Unfortunately, people who aren’t big fans of complex games are probably going to give up on Mage Knight very quickly. If you like adventure games with a little bit of deck building and a lot of meat on the bone, you should definitely check this one out. Thanks for taking the time to read our Muse card game review! To stay updated on all things cooperative board games, follow us on Twitter, Facebook, or via RSS.